The 6th Annual Hawaii Energy Conference presented by Maui Economic Development Board kicked off today on the Valley Isle. 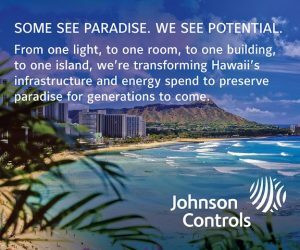 The two-day conference attracted energy industry leaders from Hawaii, the Mainland, Japan and Europe to exchange ideas on how to better serve customers in the Islands’ rapidly changing energy environment. Among the highlights of today’s program was the announcement and signing of a landmark Memorandum of Understanding (MOU) made by James “Jay” Griffin, Chair of the Hawaii Public Utilities Commission and Michael Picker, President of the California Public Utilities Commission. These Commissions will be collaborating in an effort to achieve each state’s clean energy and climate goals. Addressing climate change and limiting global warming emissions to less than two degrees Celsius by the end of this century. Development and use of low and zero-carbon technologies in the energy and transportation industries to meet each state’s aggressive clean energy goals and achieve carbon neutrality as soon as possible and no later than 2045. The promotion of carbon offset programs. Support for energy planning processes that recognize the ability of low-carbon resources to provide reliability and cost-effective benefits, while fostering new technology and innovation. Promotion of cost-effective conservation and demand response. Advancement of infrastructure to reduce carbon emissions in the energy and transportation sectors. 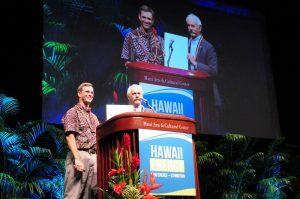 L to R: James “Jay” Griffin, Chair of the Hawaii Public Utilities Commission, and Michael Picker, President of the California Public Utilities Commission. Today, Governor David Ige was also featured among a number of key decision makers from throughout the nation who exchanged ideas on responding to the challenges associated with replacing fossil fuels with diverse and renewable energy resources. Governor Ige joined the panel “Moving Away from Convention: Innovations in Regulatory Policy,” with Michael Picker, President, California Public Utilities Commission; Abigail Anthony, Commissioner, Rhode Island Public Utilities Commission; and Jennifer Potter, Commissioner of the Hawai’i Public Utilities Commission. 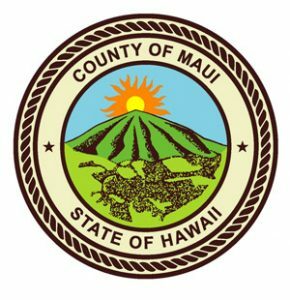 The Hawaii Energy Conference continues tomorrow (March 28) at the Maui Arts & Cultural Center in Kahului. The program will feature invited Keynote speakers, panel sessions, case studies, exhibits, and ample time for networking. For information, visit www.hawaiienergyconference.com. 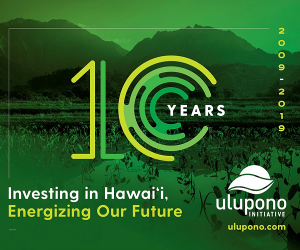 This annual conference is presented by Maui Economic Development Board, a 501(c)(3) not-for-profit corporation established in 1982 with a mission to diversify Maui County’s economy, building pathways to innovation, jobs and opportunity for our residents. Through partnerships with the public and private sector, MEDB undertakes projects that assists growth industries with navigating and thriving in our county, educates and trains residents for new careers, and engages our community in forums that determine future economic directions.